AB Equipment customer HireQuip is one of New Zealand’s leading hire companies, particularly in the area of heavy fleet requirements. 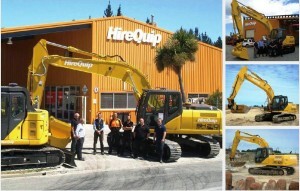 HireQuip operates from 37 branches nationwide, employs over 320 staff, and has the largest inventory of general hire equipment available in New Zealand. Sumitomo excavators are particularly popular with HireQuip and their customers, as they are employed in ongoing infrastructural projects in growth markets like Auckland and the rebuilding of Christchurch following earthquakes. Sumitomo products are proving to be very much in demand. HireQuip continues to increase its fleet of Sumitomo products, in particular Sumitomo 13 and 21-ton excavators. These products, which are in great demand from HighQuip, are part of a wider range of heavy fleet upgrades ensuring that HighQuip customers are getting the best equipment to do the job. The 13-ton Sumitomo SH135X and the Sumitomo 21-ton SH210-5LC are two very well-received excavators that are meeting the demands of a wide range of construction applications. Featuring a minimum tail swing, the 13-ton units have proven ideal for urban work. HireQuip’s decision to purchase long under-carriages and standard 600m shoes on our 21-ton units ensures ultimate machine stability spanning variable applications, while at the same time providing greater convenience during transport. Both models have anti-burst check valves to ensure safety when the equipment is used for lifting. Operator comfort for HireQuip clients is a key feature of these excavators, offering more cabin space, increased visibility, and lower noise levels. This has made Sumitomo a popular choice amongst operators and likewise with project managers, who are equally impressed with the effects it is having on productivity. HireQuip has an ongoing commitment to their Health and Safety programs and procedures, and was last year awarded ACC Tertiary Level Accreditation status following an extensive audit of its operations. A product like Sumitomo requires a high level of skill to operate, and the personnel at HireQuip are more than happy to meet their obligations to transfer critical Sumitomo operating information to the hirer.